To ask other readers questions about I Know You, please sign up. Bree and Alissa along with their brother, Tyler, did not have a terrific childhood. The dad is gone, the mother works all the time, leaving the kids alone a lot. As the oldest, Bree feels responsible for taking care of the family. Then she receives a text message. Someone has Alissa. And they want something from Bree. It becomes clear that whoever has Alissa knows their family ... and wants revenge. As Bree discovers, there are lies and even darker secrets. This is a psychological thriller about family secrets and relationships ... and what someone is willing to do to protect their family. Well written, the mystery and suspense is well paced and does not let up until the very end. Many thanks to the author / Bookouture / Netgalley for the advanced digital copy of this Psychological Drama. Opinions expressed here are unbiased and entirely my own. This is the second book I’ve read by the author, I loved Keep Her Close, it was one of those perfect binge worthy thrillers that you read in one sitting because it’s just so damn intense and fast paced that you can’t put it down until you finish. This one had that same great sense of urgency that kept me flipping pages but also really explored familial bonds and how they can have such a great impact on our lives and I really enjoyed that aspect, it brought something new and thoughtful to a reall This is the second book I’ve read by the author, I loved Keep Her Close, it was one of those perfect binge worthy thrillers that you read in one sitting because it’s just so damn intense and fast paced that you can’t put it down until you finish. This one had that same great sense of urgency that kept me flipping pages but also really explored familial bonds and how they can have such a great impact on our lives and I really enjoyed that aspect, it brought something new and thoughtful to a really exciting story. I Know You by Erik is a psychological thriller. Bree Walker seems to be the head of her family. Her Mom is working constantly to try and make ends meet, but it’s not enough to pay for three children and the trailer they live in. So Bree, even though smart enough to go to college, stayed home, and went to work. Now 26, she’s still living at home and helping out with the finances, and laundry, and meals…. Her 23 year-old brother Tyler, usually unemployed, makes occasional appearances for meals, or a place to crash for a day or two. Her sister, 16-year old Alissa, is a typical needy teenager, angry with the world and how unfair it is. Their father, an abusive alcoholic, has left for the last time – hopefully. When Bree gets a text from someone saying that they have kidnapped Alissa, Bree sets out on a wild journey to bring her sister home. Along the way she is dogged by Alissa’s best friend Liz, who insists on helping, and may know more than she is willing to admit. Tracking down her brother Tyler is almost as hard as finding her sister. It quickly becomes apparent that the kidnapper is hell-bent on revenge. Bree is unsure how much she will sacrifice to get her sister back. This book is about families, and about how relationships within a family can differ, and change over time. How families will pull together in times of need. The author created realistic characters and the rapport and/or dysfunction between them rang true. It’s a fast read, as the suspense keeps the reader interested in getting to the outcome. However, the ending seemed rushed, with a few characters outcomes left up in the air. I guess I’m one of those that need to know what happened to everyone. I hate guessing. As well, although not touted as YA, it could be. There were a few unexpected twists to keep the intrigue working. As soon as the story begins, trouble isn’t far behi This story is very much about family bonds. More so the ones between siblings. When Bree receives a text stating, simply, “find your sister”, the race is on to find sixteen year old Alissa before it is too late. Bree I Know You is a relatively short read at 221 pages, but what it lacks in pages it certainly doesn’t lack in action, it’s what I consider to be a fast paced, quick moving thriller. The Walkers can only be described as a “dysfunctional family”, with oldest daughter Bree being the main care provider by default for her younger brother and sister Alissa and Taylor. "Whatever happened next was out of Bree's hands... and that was the most terrifying thought of all." I do love my psychological thrillers, and there was just something about I Know You that sparked my interest when I was invited to read it. While I found myself flying through this story, I do have to confess I ended up having mixed thoughts about it. There is no doubt that I Know You has a fast pace and lots of twists that make the plot keep moving. I managed to finish it in less than a day, which is always a good sign for me with books under 350 pages... The premise of the story is very interesting as well, and I like how this isn't just another kidnapping case, but also a story about family bonds, flawed characters and mistakes. I can't put my finger exactly on the why, but the execution didn't manage to convince me completely though. Part of this feeling might have had to do with the plot, which I didn't find all that credible as a whole and the story didn't seem to flow all that naturally. What do I mean with this? Basically, I didn't feel the different scenes were connected in a way that felt credible and the plot twists didn't manage to convince me completely. I was surprised to find myself not all that invested in the story and characters, and I had a hard time staying focused at times. Which is strange in a way, because there is a lot happening to the Walker family and they sure have a heavy dose of hardship handed out to them. I think this feeling might be explained by the fact that I wasn't able to connect to the characters as much as I hoped, and I would have liked to see them more developed beyond their visible and most pressing flaws. I Know You is by no means a bad read and it has some interesting elements, but overall I ended up having mixed thoughts about it. That doesn't mean you won't enjoy it if you like a good mix of family drama and a kidnapping story though! Bree Walker has always been looking out for her little sister Alissa, their absent parents forcing the role of her caretaker on Bree. Then Bree discovers sixteen-year-old Alissa isn't spending time at her best friend's place like Bree thought she was... And it turns out she has been missing for the last two days. To make things worse, Bree finds Alissa's backpack abandoned on the steps of their trailer... And a chilling text confirms that something bad happened to her sister. How can Bree get her back? What an utter disappointment. 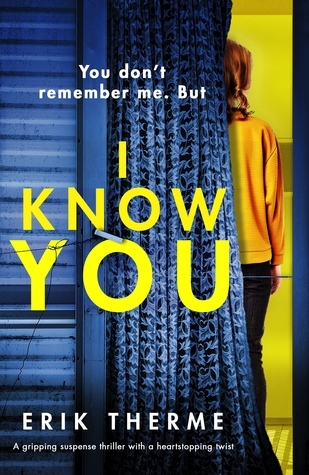 I Know You is poorly written with what appears to be a cobbled together and ridiculously improbable plot. The characters also left a lot to be desired as they very much lacked development. It is a fast-paced, easy read but time should've been taken to give the cast some relatable features as I had a real problem connecting to them or feeling anything for them and their situations. It doesn't come together as a cohesive whole making it rather disjointed, and although What an utter disappointment. I Know You is poorly written with what appears to be a cobbled together and ridiculously improbable plot. The characters also left a lot to be desired as they very much lacked development. It is a fast-paced, easy read but time should've been taken to give the cast some relatable features as I had a real problem connecting to them or feeling anything for them and their situations. It doesn't come together as a cohesive whole making it rather disjointed, and although there are some good twists I felt the execution of a decent premise failed spectacularly in attempting to catch my imagination. It really irked me and felt almost patronising that Mr Therme decided to explain everything in long-winded fashion when he could've shown it - show is so much more immersive and engaging than merely telling. This started to grate on me as it was so unnecessary. Sadly, I can only recommend this to those new to domestic thrillers and those who enjoy women's fiction and family drama; anyone who reads this genre often will easily and quickly guess the direction the story is heading. My second book by this author and once again he had me captivated from the start. Once you open this book, it’s impossible to put it down, because you are so under its spell, you just have to keep on reading. I loved the way the author build up the tension and had me totally flabbergasted by the way he pulled off a heartstopping twist at the drop of a hat. Sometimes you do not realize that something rather innocent you have done, can have such huge consequences, not only for yourself but for those My second book by this author and once again he had me captivated from the start. In my opion this is a bum-glued-to-the-chair kind of story. 5 stars. Thank you, Erik Therme, Bookouture and Netgalley. Great psychological thriller. Exciting twists and turns. I loved the family in this story. Very real. And that shocking ending! Fantastic! Then one night after Bree and Alissa have a massive argument,Alissa runs away. Bree just assumes that Alissa has gone to her best friend Liz's house and she will return home once she has calmed down Siblings Bree,Alissa and Tyler Walker had a terrible upbringing. Life was tough,living in poverty on a run down trailer park with a mother who was always at work and a drunken,abusive father. Bree has always felt that it was her responsibility to take care of her siblings and keep them safe from harm. As usual, Cassie has kicked out Jack, Bree works at a grocery store to help bring money home, Tyler has moved out and Alissa is a hormonal teenager…..but then Alissa doesn’t come home….and B Bree is the strong one in the Walker family…. At only 221 pages, I tore through I Know You in one sitting. This story was an absolute page turner filled with twists and turns along the way. I was hooked from the prologue (which takes place eight years prior to the story) where we are introduced to Jack Walker (a drunk and abusive father), an absent mother who works two jobs just so the family can survive (and also puts up with Jack’s incessant drinking and abuse), and three siblings: Bree (oldest), Tyler, and Alissa, who are essentially rai At only 221 pages, I tore through I Know You in one sitting. This story was an absolute page turner filled with twists and turns along the way. I was hooked from the prologue (which takes place eight years prior to the story) where we are introduced to Jack Walker (a drunk and abusive father), an absent mother who works two jobs just so the family can survive (and also puts up with Jack’s incessant drinking and abuse), and three siblings: Bree (oldest), Tyler, and Alissa, who are essentially raising themselves. Bree will do anything for Alissa, who is ten years her junior, and to make matters worse, Alissa constantly reminds Bree that she wishes that Bree was her mom and not the one that she has. Fast forward eight years...Bree is utterly exhausted from the physical demands of working 50+ hours per week on her feet just to ensure that her family survives. Rather than leaving to pursue her own interests, she sacrifices everything for the sake of Alissa’s well-being. Unfortunately, Bree and Alissa’s relationship has become a bit terse during Alissa’s teenage years, but this I wasn’t surprised by this since Alissa views Bree from a maternal standpoint (I rebelled like hell against my mother as a teenager, so I get it lol). However, teenager rebellion is the least of Bree’s problems when she gets anonymous texts that Alissa has been abducted. And the worst part? Bree has to enlist the help of her unreliable family members if she’s going to get Alissa back alive. I loved Bree’s character because she’s been through some sh*t. She’s so stubborn and independent but no matter what, at the end of the day she will do ANYTHING for her loved ones. My heart definitely ripped for her because she had such a hard life due to circumstances that were always outside of her control. A lot of her situation reminded me of my own growing up. The pace of this book was spot on. Bree has to interact with some pretty interesting people (at the expense of her own safety) in order to not only find Alissa but understand how Tyler fits into the equation as well. As Bree gets closer to learning the truth, the secrets and betrayal become even more sinister. From start to finish, the suspense kept me on the edge of my seat, and the author delivers a plot twist that left me speechless. When the reader moves into the main story, Bree, the eldest sibling, has just got home from work and is absolutely exhausted as she is literally working all the hours possible to keep the family afloat. However, whatever rest Bree thought she might get after her shift was abruptly ruled out when she received a chil I Know You is centred around the dysfunctional Walker family. In the short prologue, the reader learns what they need to know about the father and his terrifying rule over the family. Talk about dysfunctional families and the Walker's are right on top of that list. This story strikes a very good balance between family drama & suspense, without getting too touchy/Feely which is something I really liked. I love how all the characters in here have their shortcomings and flaws, yet such strong personas. The plot is very very good! It's fast-paced, twisty and a real page turner! I like how despite her age, Bree Walker shows such maturity, and rationality even as time is running Talk about dysfunctional families and the Walker's are right on top of that list. This story strikes a very good balance between family drama & suspense, without getting too touchy/Feely which is something I really liked. I love how all the characters in here have their shortcomings and flaws, yet such strong personas. The plot is very very good! It's fast-paced, twisty and a real page turner! I like how despite her age, Bree Walker shows such maturity, and rationality even as time is running out for her sister Alissa. She's a personification of the saying "when the going gets tough, the tough get going". Going through the letter from Erik Therme at the end, made me appreciate this book better. I did find the finale to end a bit abruptly as I was left with quite some questions about the fate of some characters. I really hoped for some closure. Nonetheless, I thoroughly enjoyed reading this book and I would recommend reading it. I really enjoyed this suspenseful thriller! It was a fast-paced, whodunnit story that kept me on my toes and kept me turning those pages. When I wasn’t reading, I found myself thinking about the story, wanting to get back to it so I could find out WTH was going on. This was my first read by this author and I look forward to reading more from him! It took me a minute to get into this book. I felt like it was more thriller than my usual cozy mystery. Now that I think about it, there was no dead body till the end and I won’t spoil who. This was a story about an abduction of a 16 year old girl from a trailer park. I knew there had to be a personal reason why the victim was taken since their family was around the poverty level. And since most abductions were about money, I figured this was personal. The mother spent most her time at work and It took me a minute to get into this book. I felt like it was more thriller than my usual cozy mystery. Now that I think about it, there was no dead body till the end and I won’t spoil who. This was a story about an abduction of a 16 year old girl from a trailer park. I knew there had to be a personal reason why the victim was taken since their family was around the poverty level. And since most abductions were about money, I figured this was personal. The mother spent most her time at work and father had left the family years earlier. Bree was the only adult in the family, it seems and she was barely starting her adult life. This book makes you care for Bree and how she goes about finding her sister and all the pitfalls she encounters. It was good. Very good. I liked it a lot. I totally recommend it. One of the better books I have read this year. Hope to read more from this author. I have seen lots of social media regarding this book and was fortunate enough to receive a copy from Netgalley. I haven't read any from Erik Therme before. The issues raised of family abuse, lies, secrets and addiction were the base of the story. The book was a quick read and kept me interested enough to continue until the end. I would have preferred the settings to be more descriptive considering where some of the story was set. But, I appreciated the writing was concentrating on the personal st I have seen lots of social media regarding this book and was fortunate enough to receive a copy from Netgalley. I haven't read any from Erik Therme before. I've read and enjoyed previous books by Erik Therme and was looking forward to read this new title. This a fast paced gripping thriller with plenty of twists and turns that I didn't see coming. It deals with a dysfunctional family and how despite all the despair when danger looms the main character's devotion to her family and their well being is unquestionable. Thanks #Netgalley, #Bookouture, and #ErikTherme for a chance to read this book. This is a psychological thriller about family secrets and relationships ... and what someone is willing to do to protect their family. Well written, the mystery and suspense is well paced and does not let up until the very end. I loved the way the author build up the tension and had me totally flabbergasted by the way he pulled off a heart stopping twist at the drop of a hat. Compulsive, Twisty and Absorbing and I loved it. Can't wait to read the authors' next book. 3.5 Stars - This book started out really well. A drunk father, a mother working two jobs, and a sister playing “mom” to her younger sister and brother...a set up for the perfect storm. While most people would have gone off to college or, at the very least, up and left a toxic family situation, twenty-six-year-old Bree took it upon herself to continue living at home, helping provide for a family she was determined to keep together. Though her brother was often off the grid and her sister was the 3.5 Stars - This book started out really well. A drunk father, a mother working two jobs, and a sister playing “mom” to her younger sister and brother...a set up for the perfect storm. While most people would have gone off to college or, at the very least, up and left a toxic family situation, twenty-six-year-old Bree took it upon herself to continue living at home, helping provide for a family she was determined to keep together. Though her brother was often off the grid and her sister was the definition of teenage drama, Bree seemed to take it all in stride. That is until she came home one day to find Alissa’s backpack on their doorstep and a mysterious text message telling her to bring her brother Tyler in exchange for Alissa’s safety. From there, Bree makes it her mission to find both Tyler and Alissa, once again taking on the protective matriarchal role. While I found myself wanting to know how this story was going to pan out, it wasn’t as suspenseful or thrilling as I had hoped it would be. Often the “suspenseful” scenes fizzled out, and when they finally got to the bottom of who took Alissa, I thought there would be this epic scene that brought the story full circle, but it wasn’t very climatic. At that point, I was expecting a lot more drama to ensue but instead was left disappointed. I will say the book itself and the dialogue flowed very well, and this was a quick read for me. I just wish the book had lived up to the “gripping suspense thriller” that it claimed to be. Bree Walker is 26-years-old and lives in a trailer with her mother, younger siblings, Alissa, 16, and Tyler. Life has always been difficult for them as their father is an alcoholic and a gambler, and after putting up with him for many years, her mother kicked him out. Now, her mother works two jobs to pay bills. Bree also works long hours as a checker in a grocery store doing all she can to keep up and protect her siblings. One day, Bree learns that Alissa apparently has been kidnapped. She finds Bree Walker is 26-years-old and lives in a trailer with her mother, younger siblings, Alissa, 16, and Tyler. Life has always been difficult for them as their father is an alcoholic and a gambler, and after putting up with him for many years, her mother kicked him out. Now, her mother works two jobs to pay bills. Bree also works long hours as a checker in a grocery store doing all she can to keep up and protect her siblings. One day, Bree learns that Alissa apparently has been kidnapped. She finds Alissa’s backpack sitting on the doorstep and a photo inside shows the girl sitting in a concrete cell. She gets a message that if she wants Alissa back, she has to give Tyler to this person. Thus, the race is on by the determined Bree to do anything she can to find her beloved sister. This means coming face to face with some very lowlife people to put the pieces of the puzzle together. Who took Alissa and why do they want Tyler in exchange? This is a very gritty story with characters of little or no redeeming value. I found a lot of repetitive verbiage in the story. Unfortunately, this book is a total turnoff to me and I cannot say that I enjoyed reading it at all. The world is a big place but you can't simply fall off the face of the Earth and nobody notice. Or can you? Well, you see Bree is the sis of Alissa and that's exactly what may have happened here. We do have a whole host of crazies surrounding Alissa - you know blood is thicker than water- but these folks may want to be given a closer examination. For instance, how 'b The world is a big place but you can't simply fall off the face of the Earth and nobody notice. Or can you? So much finger pointing but surely someone has the answers and that someone may be closer than you think! I mean Bree has after all truly raised Alissa after the parental neglect issues in this family so it's only natural that perhaps this is a bigger case than first imagined! Really fast paced psychological thriller and even better that this one focused a lot on family relationships. The characters all seemed so realistic and well written. Actually, I loved the writing style in general and just how much punch was packed into a relatively short book. I figured out a couple of the twists but a few did surprise me. I licked it up in under a day and I'd totally recommend. I Know You is a fast paced suspenseful read. I enjoyed the twists and turns the author puts the reader through while keeping them glued to the page. Getting the backstory on the family was interesting and seeing how they rely on each other through thick and thin. Also the abductor wasnt predictable which I appreciated. I’m interested to read another if this authot’s works. Read I Know You, it will keep you on the edge of your seat! I found this author at a book signing awhile ago and just currently started reading his books. I'm absolutely loving them. This is his newest one and I loved it. It kept me on my seat from the beginning. Twisting and turning and trying to guess who did what and why. 2 sisters with each other's back's and a brother that isn't always on the straight and narrow. As one sister goes missing the other is left to figure out how her brother is connected. Joining forces with her brother she can only hope I found this author at a book signing awhile ago and just currently started reading his books. I'm absolutely loving them. This is his newest one and I loved it. It kept me on my seat from the beginning. Twisting and turning and trying to guess who did what and why. 2 sisters with each other's back's and a brother that isn't always on the straight and narrow. As one sister goes missing the other is left to figure out how her brother is connected. Joining forces with her brother she can only hope to find their sister before it's too late. Gripping and fast paced. Great characters and storyline. If you haven't read any of Erik's books yet, you are missing out. You will not be disappointed. This book was interesting. It follows Bree as she searches for her missing 16 year old sister. The Walker family struggles financially. The mom works two jobs and Bree has been working since she was 16 to help provide for the family. After Bree and Alyssa get into a big fight, Alyssa leaves and goes missing. Who has her? Will Bree find out who and why someone took her sister? This book definitely kept me guessing. Quick, thrilling read! I really liked the concept of this book. And think it would be an amazing movie, I just didn't get sucked into the story like I would have hoped to. I find that it was lacking just enough details to feel like you were apart of the story. It was a really good story line all together though!